Awesome Advertising Promotions For $2 And Under! Get Ready For National Breast Cancer Awareness Month 2018! Comments Off on Get Ready For National Breast Cancer Awareness Month 2018! Branded Ideas For Breast Cancer Awareness Month 2018: Every year in the month of October we focus on National Breast Cancer Awareness month and finding a cure for breast cancer. Let’s all show we care and show support for Breast Cancer Awareness by handing out promotional pink promos with your business logo! 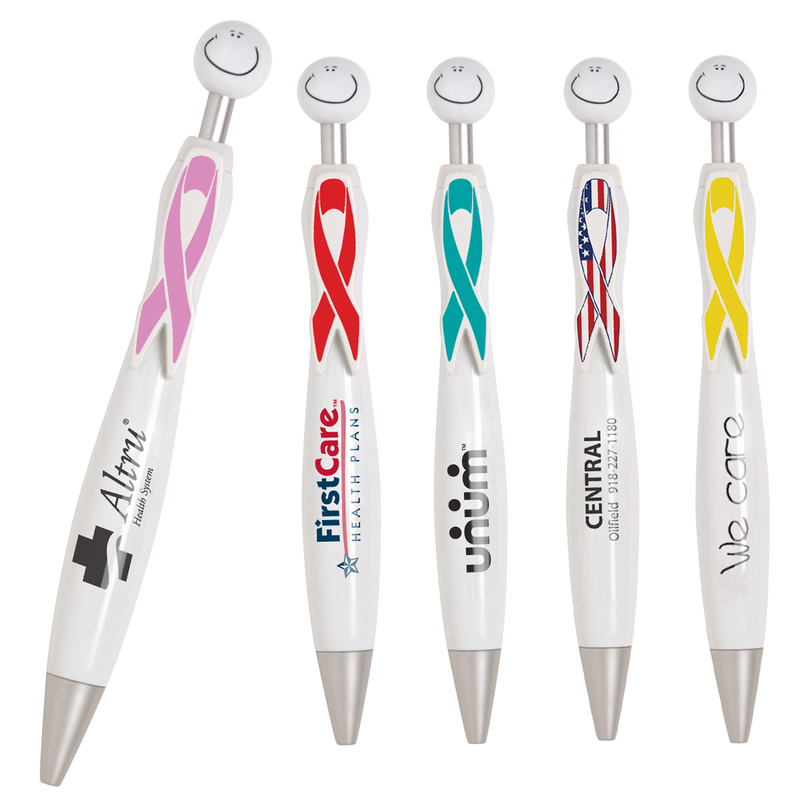 We have new promos this year to consider for your awareness marketing ideas, like our branded swanky awareness pens. Get your pens ready for the best company exposure and hand them out at your special event. We have tons of great advertising ideas for breast cancer awareness month, we want your company to stand out and be heard! Some of the best ideas to giveaway during this time is personalized T-shirts, logo hats, tote bags, wristbands, magnets and pens. Here at Executive Advertising, we are always ready for this special time of year with getting your pink products ready, customized and sent to you on time! Now is the time to get ready to view our imprinted breast cancer items, check on stock of items and start your order process. October will be here soon, so let us help you get your pink promos ready! You can customize your business name, logo, special message, dates and more in your imprint area for free with No Set Up Fees! Very special events such as 5K runs and walks will take place to raise money for patients with breast cancer,this is a great time to come together with promotional items to show how much we are dedicated to winning this battle. People receiving the free custom awareness items will never forget your business. Make the whole month very special for your company and order a bulk of advertising pink promos and let clients know you care for Breast Cancer Awareness Month! Safe Personalized Halloween Promos: Halloween is coming soon, you need custom plastic candy bags for your business name and logo. Your custom imprint area is designed under the pumpkin on the FRONT side, so if you’re looking to promote your business this will be a great time to do so. You can sweeten the deal on advertising by handing out Halloween items with your business information this year. Clients love free personalized holiday promos to use and keeping customers safe is businesses big priority. Here’s some fun news, if you don’t want to customize the pumpkin, we have other marketing plastic candy bag options available. Most of our options come with the safety tips imprinted and other printed images for spreading awareness. All these bag choices make excellent Halloween promotional products for schools, libraries, toy stores, and grocery stores, basically any place that has children coming in and out! So help them save a little money and provide some bulk trick or treat bags starting at $0.45 for the kids, one great investment each year for your business, they’ll remember to stop in for a free bag. Also advertise coming back to your business for handing out candy on Halloween, whoever didn’t receive a free bag, can attend the trick or treat event and get free candy as well! Customize your name, logo and business info on the front of branded Halloween candy bags with No Set Up Fees for an excellent order of cheap bulk items for Halloween night. 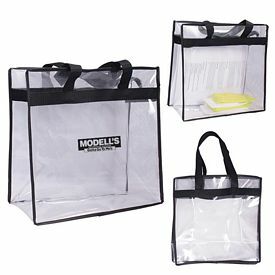 While you’re at it, check out all of our plastic bag options, pumpkins and more for your business logo. Happy Halloween! 2018 Custom College Promos: Promotional products are prime for colleges, get your branded college gear from Executive Advertising! Our marketing ideas are great for awareness and school spirit. The appeal of branded merchandise for colleges is simple: once they’re at school, students become walking billboards for the rest of their lives (as do their parents, siblings and countless others). You need to customize some of our marketing ideas in apparel, drinkware, spirit items and more. Let’s start with our personalized apparel in t-shirts, hoodies and sweatshirts. Your school logo will be flashing on the front and back if you choose for everyone to see. 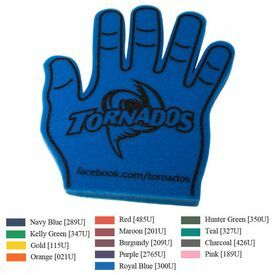 Next, grab your imprinted foam hands, customize with your team name and logo. Choose from our many colors that represent your school colors. Any promotional item you find for college, school spirit or awareness will be printed with your 1-color free logo and No Set Up Fees! 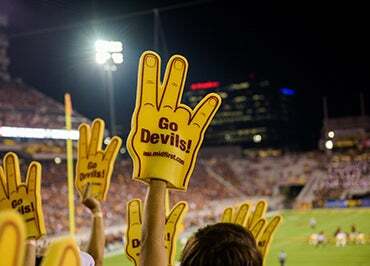 We know all college games are loud and rowdy, to insure ultimate spirit, view our personalized noise makers, our logo hand clappers and custom cow bells will encourage the crowd to cheer for their team. When it comes to prepping for college, there are advertising promos that you might haven’t even thought of yet, like let us get you ready with our promotional laundry bags, have an easy idea for all your clothes, you’ll need custom laptop sleeves and bags for your laptop and tablets. Get ready for a fun filled year in college and have all the essentials you need from Executive Advertising. We’ll get everything ready and to you quickly for the ultimate college party, tailgating and for showing school spirit everyday! What’s Smart And Useful For Your Branded Business Logo? Comments Off on What’s Smart And Useful For Your Branded Business Logo? Why You Need Promotional Umbrellas: Get ready for more rainy weather sooner than later with the fall season approaching! Time to think of a business gift that’ll be very useful and will have smart advertising of your business name. Everyone needs personalized umbrellas to handout to their clients! Custom umbrellas are carried around by people on a daily basis, in their car, bag and suitcase. They help protect you from the rain and sun. Our logo umbrellas are very important to have. Let Executive Advertising get your imprinted umbrellas ready for your next company giveaway! You won’t believe all of our choices in custom umbrellas, lots of sizes and colors for your business logo. Promotional umbrellas can be one of the best marketing tools around, they stand out in the crowds and show off your 1-Color free logo big and boldly. You can have one of the best advertising walking billboards with customized umbrellas. Let us here at Executive Advertising get your bulk of branded umbrellas ready for your next event. Logo umbrellas are great budget promos for your wallet. You won’t have to second guess the branded umbrella when buying, you can buy a real cheap product or spend a little more and get the promotional umbrella that will last forever. So be there for your clients rain or shine and customize our umbrellas or your next personalized gift! Fans Will Love Personalized Mini Footballs: Get into the hearts of football fans and customers, and pass out free mini promotional footballs. Have fun customizing logo mini footballs with your business name, school or team name for free. You can boost team spirit and gain business with our branded mini football choices. Order imprinted mini footballs for under $1 each. These small advertising footballs will be the hottest item around with your marketing logo. 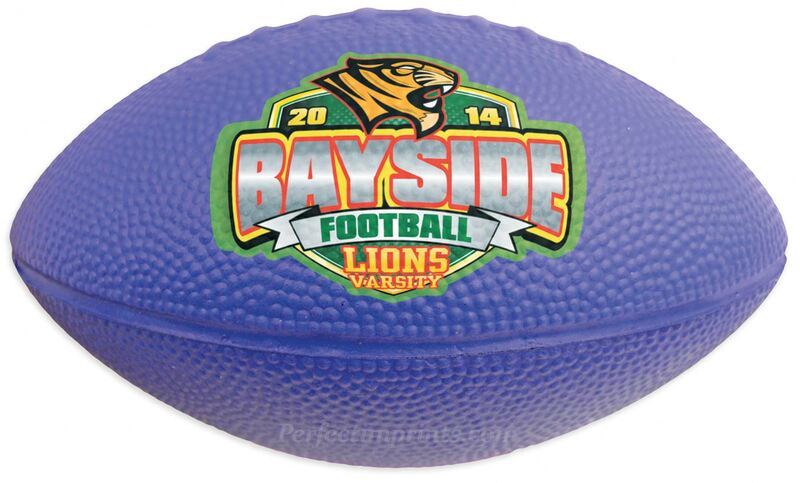 View all of our custom mini footballs, we’ve got lots of color choices for your school & business colors. Get everyone excited about the upcoming season and decorate your football with a message and slogan to kickoff the season. Students will love these free gifts at and away from school! Anyone on a budget will see our footballs are low cost and any other football items you need have low prices all year long. Score a touchdown with Executive Advertising’s football promos! Keep the spark all season long and get promotional football items ready now! Let us know how to design your footballs, they’ll deliver to you quickly by the the time season starts. Football is more fun when you have branded football items to show team spirit. And your business will love new faces when you have personalized football gifts for them for free. Get your school football team ready, get the crowd ready with these imprinted footballs and go win some games. Useful Promotional Gifts For Schools & Businesses: Imprinted Spiral Bound Notebooks and Journals are perfect for keeping daily records or taking notes. Customized Notebooks and Journals are simple yet effective promotional products. You should consider handing out these promotional products to college and high-school students. 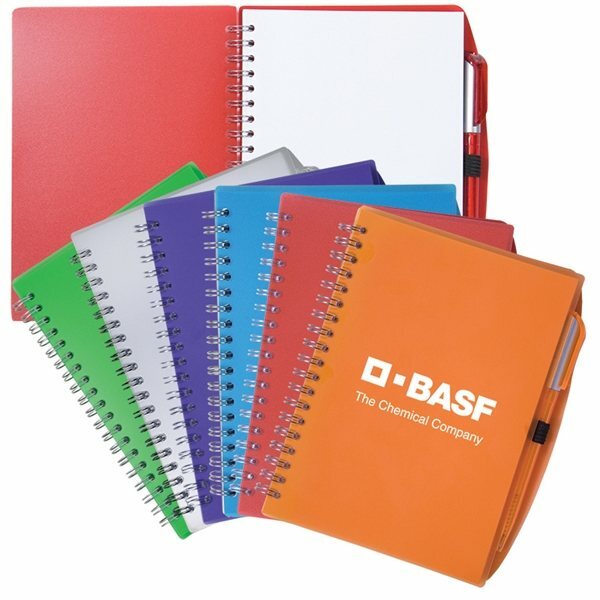 Get your business name on advertising notebooks and journals with your customized 1-color free logo and no set up fees. Personalized notebooks are a perfect example of such promotional products as they are used by students, teachers, professors and working professionals. When students start school, they can receive a free giveaway of logo notebooks. Even the next office meeting can have handouts of imprinted journals for note taking. Here at Executive Advertising, we all know how important it is to promote your name, so ordering our custom journals and notebooks will defiantly promote your brand! We carry hundreds of journals and notebooks, whether you’re looking for fancy or cost effective we have you covered. Depending on the product, you will be able to get a free 1-color screen or a laser engraving. So don’t hesitate, keep up with important notes, everyday planning and schedules with our advertising journals and notebooks. Order a bulk of these personalized note takers for your next custom gift idea! Are You A Fan Of Football? Here’s Tailgating Advertising Ideas! Comments Off on Are You A Fan Of Football? Here’s Tailgating Advertising Ideas! Are You Ready For Football Season 2018? Football season is coming soon! This is one of the most exciting times of the year for adverting your brand on promotional football products. Tailgating is the ultimate fun before the game, here at Executive Advertising, we have tons of personalized football ideas to pass out at your parties. 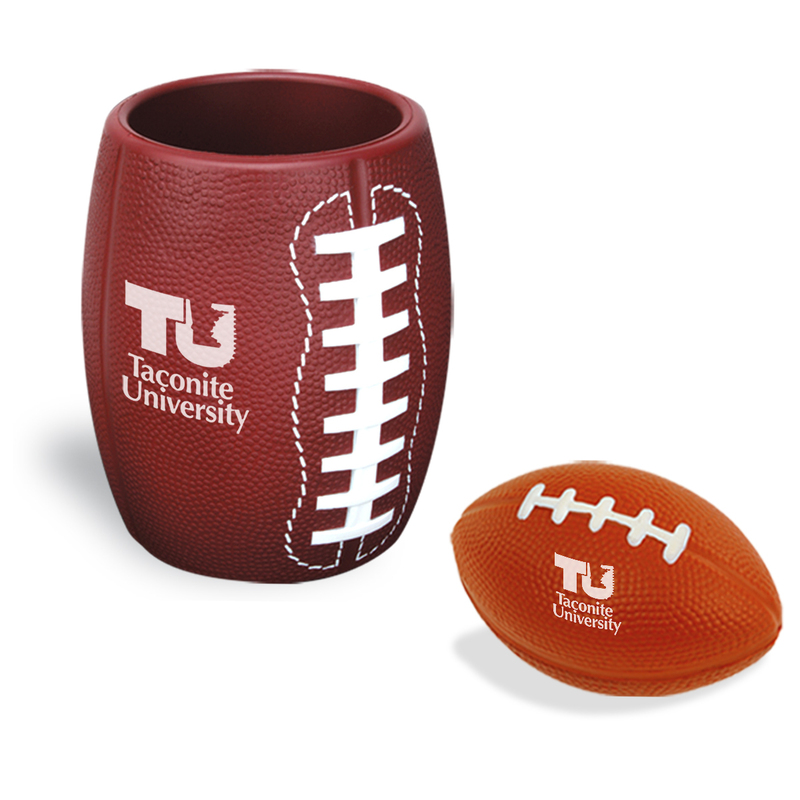 If you love football, you’ll love tailgating with our logo football can holder and stress ball. We all need a stylish football can holder for our cold drinks and why not have the imprinted football to toss around while hanging out? It’s such a great time to get your friends, co-workers and family together to have some fun in cheering for your favorite team. We all know colleges take their football teams, pep rallies and tailgating very seriously, so lets design and promote some football promos with your college name for free with No Set Up Fees for awesome team spirit. Don’t forget other items like custom football cooling fans, helmet shaped coasters, schedule magnets and more for your business name. And it’s extremely important to remember the safety of going to the games each week. If you’re attending tailgating or the games, don’t forget to pack everything in your promotional all access stadium tote bag. Security needs to see everything that’s coming through the gates to keep everyone safe! You can match your team and school colors to our custom football ideas, search our website for the marketing fun for football. Let us know here at Executive Advertising how to decorate your football products to get them to you quickly for a awesome upcoming football season! What Advertising Products Do You Need For Back To School? Comments Off on What Advertising Products Do You Need For Back To School? Get Ready For Back To School & Promos: Almost back to school and college in a few weeks, stock up on our school promotions and ideas. We’ll show you some specials for heading back soon! 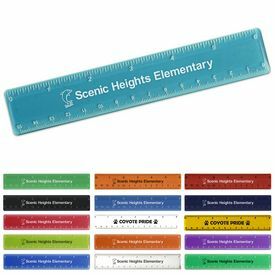 Here at Executive Advertising, we have tons of promotional products that are used for school promotions and supplies. Our advertising supplies such as custom pencils, pens, notepads, scissors, cases, bags and more are used all during the school year and beyond. Kids love personalized school stuff and showing off school spirit, customize our school ideas with your 1-Color free logo and no set up fees! Stock up on logo supplies that are needed the first day for your school and classroom. Schools can have some awesome giveaways when school is back in session, imprint drawstring bags and promo water bottles with the school name or special message. Hand out items to everyone, have a special contest or fundraiser where the kids win the branded items for prizes. Have a fantastic year when school goes back, show spirit and advertise your school name all year through! Let us know here at Executive Advertising how to personalize your bulk order of school items, we’ll get them ready and to you before school starts in a few weeks. And remember we’ll customize everything for free! Promotional Healthcare Giveaway Ideas: Here at Executive Advertising, we have a huge selection in promotional health care promos. This timer is the perfect item to highlight your logo. These branded products are used for education, travel, healthcare and dentistry. View some of our new branded products for your custom logo. The imprinted smile two minute brushing sand timer is a new very cool promo for dentist offices! 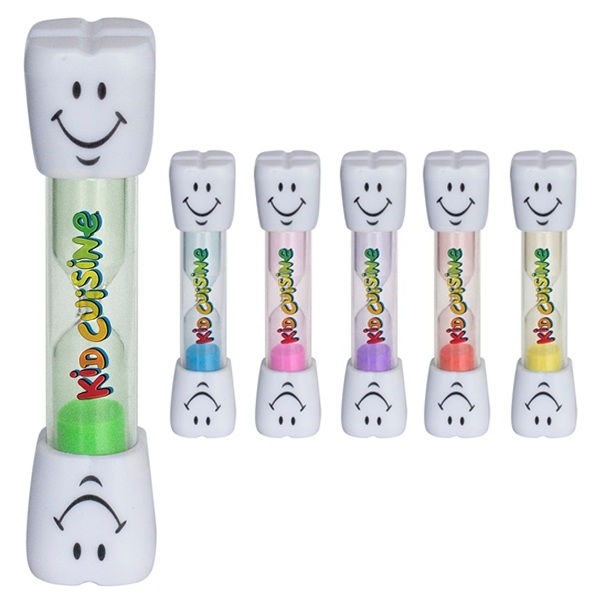 Hand these out to young kids and they’ll help count out the perfect amount of time for brushing by flipping over this cute timer when they begin to brush. Available in a variety of fun colors, let us know how to design your business logo on personalized health care ideas. You can customize this advertising timer or any of our products with your 1-color logo and no set up fees. Other items such as personalized toothbrushes, toothpaste, hand sanitizer, lip balm and more are perfect for travel and resale with your business name. They all help promote the very best health for all of us and are sold in bulk here at Executive Advertising for a cheap budget price to keep your company name going around! Your clients will appreciate all of these nice free handouts with the business name, they’ll always remember the nice gesture in making the customer feel welcome and gaining their return next time. Especially on branded promos that are healthy and can be used more than once. What Promotional Item is Trending Now? Comments Off on What Promotional Item is Trending Now? The Perfect Personalized Summer Gift: Our promotional logo koozies are good advertising products for companies looking to create an impact on their clients and increase their sales. Personalized Koozies are used year around but, their the trendiest in the summer! Handing out free branded can coolers is a great idea for your business name. Choose from our many koozie ideas for your drinks, you can customize your 1-Color Free Logo or we have the full color processing available. 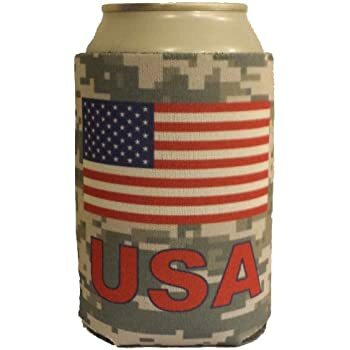 Order a bulk of imprinted can koozies for customer handouts. Branded Koozies make excellent giveaways at trade shows, company picnics, summer festivals, and they even make great wedding gifts. They can be imprinted with names, dates and unforgettable message. See advertising koozies are great custom gifts, you can have your bulk of can koozies imprinted for free with your logo and business information for free and no set up fees. These promos are cheap friendly ideas for your business budget! 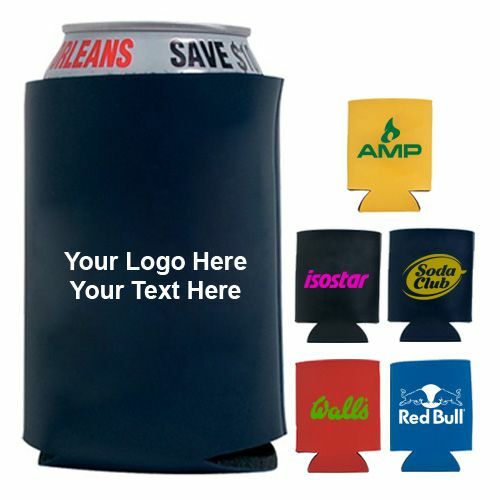 Shop Executive Advertising for all your custom koozie ideas and promotional products! We’ll have your order ready and to you on time for all your parties and events that are coming up all summer long! Let’s get to promoting your brand on logo drink koozies, passing them out as free gifts, then customers hang out with their cold drinks and advertise your business logo. Fresh And Simple Advertising Ideas In The New Year! How Can You Celebrate On Earth Day?